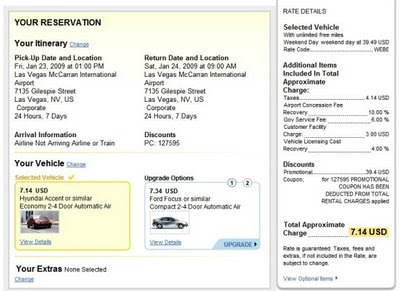 Heres an interesting deal from Hertz rental cars. They are offering a FREE weekend one day car rental and all you have to do is pay the taxes. Theres no minimum days and its unlimited miles. The offer isn't available in all locations and there are terms and conditions. Weekend is pickup Noon Thursday through Noon Sunday. I checked it out for a Hertz location near me and it seemed to work. It showed the rate as $0 for a 1 day rental. It doesn't seem to apply to large vehicles like trucks or SUVs. I think you also have to pickup the rental on a Weekend day. So if you pickup on Monday through Wednesday then it doesn't accept the discount code. Use the link or go to Hertz and enter Promotional coupon # 127595. This is a great deal if you want a car for 1 weekend day. Or its a good way to get 1 day off of a multi-day weekend rental. (I didn't actually make a reservation, but was just testing it out to see if it would work. I assume that theres no other catches involved. I heard about this one at Fatwallet.